Celestron NexStar 130SLT Review | What is the Best Beginner Telescope? Bright guy, Sir Isaac Newton: He managed to distill the mechanics of our local universe down to three simple laws of motion. He developed much of mathematical calculus. And he harnessed the magnification properties of concave mirrors to drive a new type of telescope. His new "reflecting" telescope solved a problem: It didn’t cause light to break apart into colors (as Galileo’s refractor did). It made for telescopes that could gulp more light for their length. In 1668, Newton opened up the universe for closer inspection. Over the past three and a half centuries, Newton’s Reflectors have evolved into comfortable, powerful, elegant instruments that are simple to use. Among the best we’ve found for under $500 is Celestron's NexStar 130SLT. That "130" refers to the aperture ("opening") expressed in millimeters. This model is a recent upgrade from a smaller 114mm Celestron. It’s now more than 5 inches. Aperture is nearly everything in telescopes; more photons reach your eye, camera or spectroscope. And the more starlight you grab, the more illuminated your understanding of the cosmos. You’ll have many chances to be thus enlightened by the 130SLT. We found it’s aluminized glass mirror to be surprisingly well ground and polished for a scope in this price-range. A thin, but strong "spider" holds a well-milled secondary mirror securely in position to reflect photons through your eyepiece. Newton would be pleased. Celestron supplies two nice eyepieces with the NexStar 130. The "wider" of the two, the 25mm, is about right to stare at galaxies or – with an added lunar filter – at the moon. The "tighter," a 9mm, will show you larger details on planets. But you will probably want a higher power eyepiece (or a magnification doubling Barlow) to see phenomena like the moons of Jupiter casting shadows on the Big World’s face. This NexStar is compatible with 2" eyepieces. That opens up some great possibilities for wide field "space-walking" – a real feeling of being out there among them. It also lends an element of future proofing; your next telescope (after this NexStar) is likely to crave 2” glass. And eyepieces can last for generations; you’ll pass them to your grandchildren. Like cars and musical instruments, telescopes do need occasional tune-ups. Reflectors in particular must be "collimated" from time to time. Our NexStar showed up from the factory not needing adjustment. Its optical axis was nicely aligned to make sharp images. Stars (except for our Sun) are effectively point sources on the sky. If you notice stars starting to "bloom" in your eyepiece, it’s probably time to collimate. 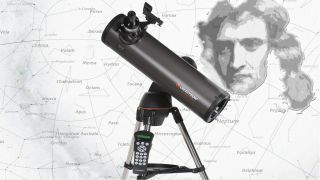 Celestron’s SkyAlign system is a masterpiece. It lets you use objects in the night sky to set up the scope’s tracking without know which they actually are. Yes, I’m championing ignorance in saying this but that’s a huge improvement. In most other systems, you must know what star you’re looking at. With SkyAlign, you don’t. In fact, you can even use a planet (it’s hard for beginners to tell the difference). You just need to level the tripod; then tell the system your rough location, plus the date and time. Then just introduce the telescope to any three bright lights (well, not an airplane or satellite) and the computer will be happy as a clam. You will be too, as you slew around to your choice of 4000 objects; planets, galaxies, nebulae, stars and clusters. There aren’t as many in the database as some other beginner scope system. But as a practical matter, if you find time to observe even half of those 4k, you long since ceased being a beginner! Our reviewers were happy the Celestron NexStar’s battery pack in located within the mount. That means no cable to wrap and tangle as the telescope moves. But, to be fair, an external "power tank" will hold much more charge for much longer observing and can power other devices (say, your laptop … or heated gloves!). Set-up is dead simple. I’m a monkey-see/monkey-do type: I loved that there’s a cute, helpful online video. The tripod and mount are lightweight. Good for portability; maybe bad for durability. But only time will tell. We did notice the images wiggle a bit for a second or so after the optical tube was nudged, a consequence of that relatively light duty mount and tripod. But telescope makers must trade-off something, somewhere, to stay in business. And, when observing faint objects, there’s one actual benefit to a bit of "shimmer" or "dance": Your eye and brain will work harder to build up a mental picture. You’ll actually see more small details if you “ping” the telescope by tapping your eyepiece, or the optical tube, gently. Try it! This telescope isn’t for targets on Earth. It’s Newtonian design demands that you stand or sit at the side of the optical tube. And the image is inverted. So it’s not a point and shoot spyglass. [For that, you would want a Refractor or Hybrid.] But take the NexStar 130 out on star-date night and your view will be truly stellar. With a 130mm (5inches) of beefy main mirror, we didn’t expect this unit to be a featherweight. But its 18lbs is quite doable, even if you have a long-ish carry to your dark sky site. And the whole rig is small enough for most cars if you’re outbound to escape local light pollution. If, like me, you’re fundamentally lazy, it’s nice to have a computerized "go-to" scope out there under the stars. But it’s even nicer to know what you could see hours or days before your observing session. Celestron wants to help you here too: They’ve provided a disk of "The Sky" astronomy software, one of the best software planetariums out there for laptop, notebook or desktop computers. And speaking of computers, Celestron also gives you a 2nd disk with utilities to control your 130. [Sorry no tablet support … yet.] To pull this trick off, you will need the correct cable. It’s available (but not included) from Celestron. Order it online. Celestron’s telephone support can be a bit frustrating. But our review crew loved their website. It’s packed with knowledge bases, set-up videos, downloads and complete issue resolution procedures. Any beginner with a web connection and time to spend at Celestron.com won’t be a beginner for long. Out under the night sky, with million year-old photons coming to rest on the back of your eyeball, you will sense his presence; Old Sir Isaac Newton, standing there at your shoulder. For more choices, please check this interactive chart comparing our top ten telescope picks for beginners. Or look at some accessories – and lots of other space gear–in our SPACE.com Store.